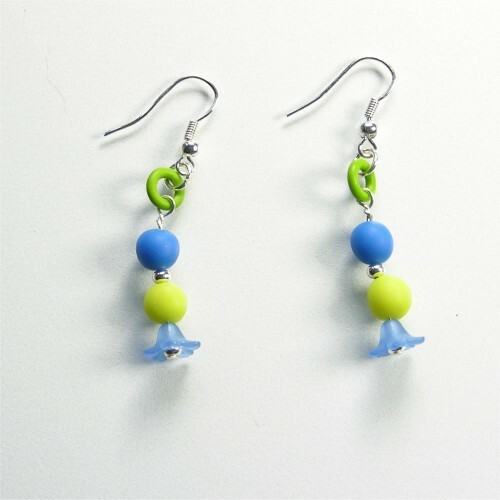 P106 These green and blue mixed bead earrings would be great for the summer. They have silver plated fittings and measure 3.5cm. P104 These brightly coloured mixed bead earrings would be great for the summer. They have silver plated fittings and measure 3.5cm. 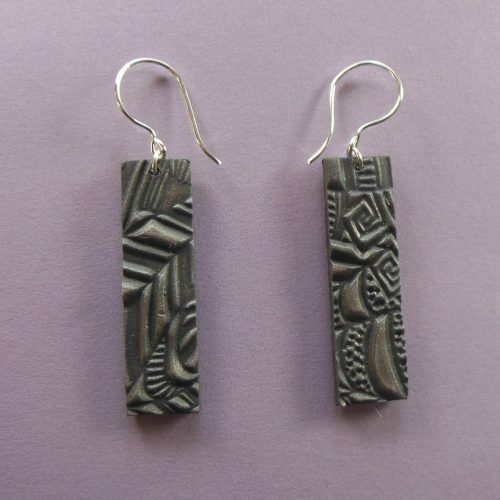 S341A pair of 2cm square earrings, with a deeply textured pattern, treated to resemble old metal. They have handmade sterling silver fittings. S340 A pair of 4cm long rectangular earrings, with a deeply textured pattern, treated to resemble old metal. They have handmade sterling silver fittings. 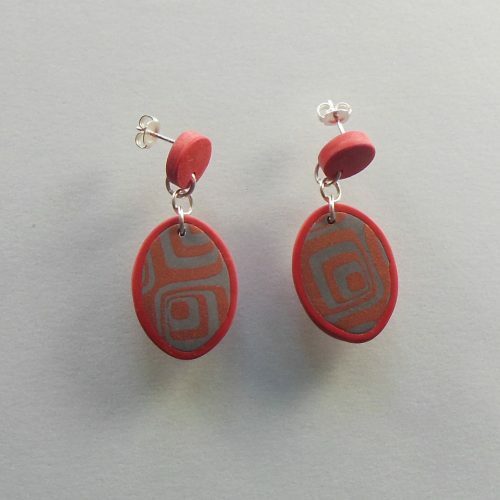 S352 These oval earrings have a design in gold on a shaded grey background with a red border, suspended from a red disc. They have stud fittings and measure 3 cm long. There is a pendant to match on this site. 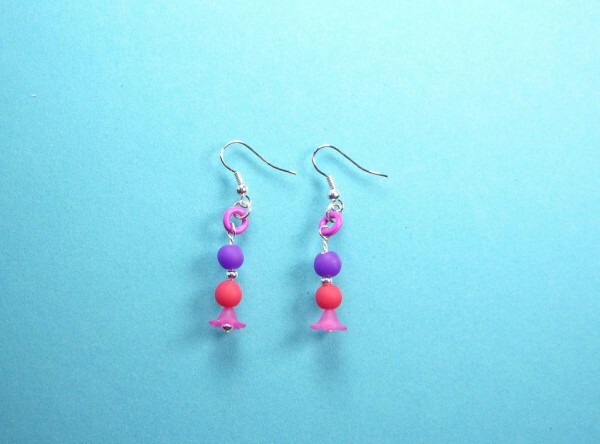 S205 Shiny irregularly patterned earrings in shades of pink and purple. They are 3cm square and have handmade sterling silver fittings. 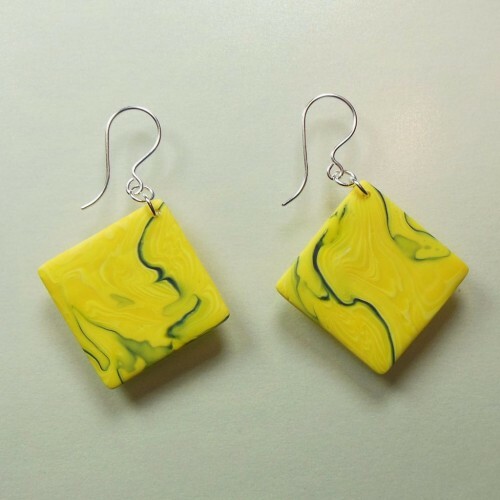 S249 2.5cm square yellow polymer clay earrings with an irregular squiggle design in blue. They have handmade sterling silver fittings. S306 Turquoise elongated leaf shape earrings, with a white design and black and silver coloured embellishments, glass beads and hand-made sterling silver fittings. 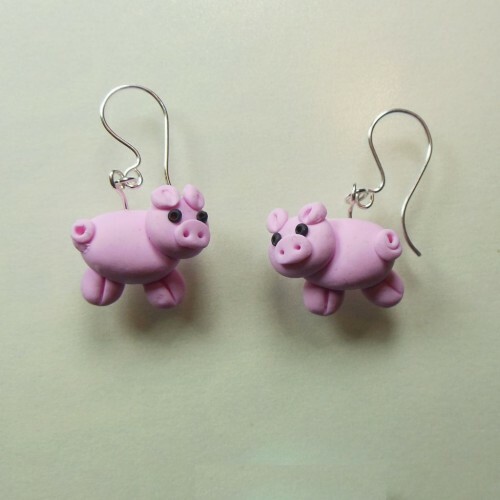 S253 Polymer clay pig earrings, with handmade sterling silver fittings. 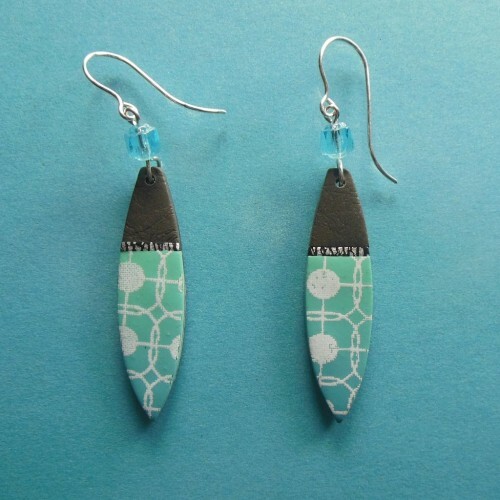 S319 These black and grey polymer clay earrings have an irregular circle and regular stripes design. They measure 5cm long and have handmade sterling silver fittings. 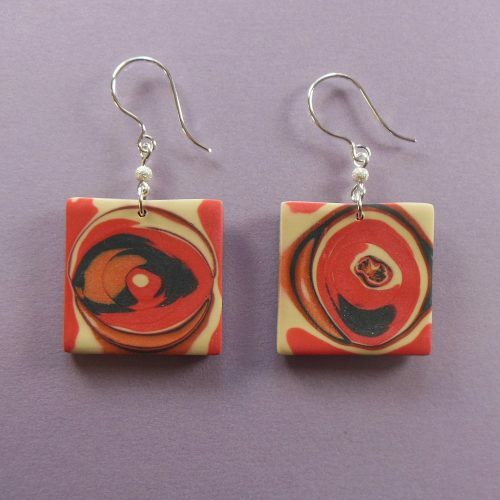 S338 A pair of 3cm square earrings with a random coral, black and ecru swirling design, topped with a tiny sparkly sterling silver bead. They have handmade sterling silver fittings.